Update on our Kohl's situation (for those who saw the first post). After many phone calls (all of which were very polite but mostly didn't seem to change anything), we finally (apparently) talked to the right person in the fraud department and they FINALLY have taken the items we didn't order and didn't want and actually returned off our bill (along with late fees and all). It was an incredibly frustrating situation beginning in December, but we're FINALLY all cleared up. Just wanted to let folks know -- Kohl's didn't come through quickly but they did come through eventually. My trip to NESCBWI was brief this year as I really couldn't spare much more than the time for my workshops on Sunday. Still, I got to hear some fantastic stuff even so. I heard an amazing speech from Jo Knowles -- she's just always so moving to hear. Then I enjoyed the panel on Diversity because it's a subject I'm really interested in right now. Each person on the panel had a different point of view into the topic, which is terrific for a panel on diversity. Then Sunday, Chris Cheng was super and not just because I love hearing an Australian accent. My workshop audiences were attentive and so encouraging and complimentary. Anyone who works in publishing but not in kidlit is missing out on some of the kindest people. Then I enjoyed Marvin Terban's lunch talk. He's funny and I'm always interested in learning more about humor in writing since that's so important to my own writing. Then he surprised me HUGELY by quoting from MY piece on humor -- and he actually agreed with me. I mean, obviously I think I'm right, but I'm always chuffed when someone else things so too! So, what did I walk away with? I write fairly light stuff, but Jo Knowles' talk about saying what's true made me aware again of how important that is. I think we can tell the truth in lots of different ways and my way is much lighter, but I think it takes all of us together to meet the needs of all readers. And whether light or serious -- we really should stop with our books until their true. Also, as Chris Cheng talked about all the fantastic things that have come his way just because he was willing to say "Yes" to them, I really connected with that. My own publishing path has had many side roads that took me valuable places, all because I was willing to take a risk and say, "Yes." The diversity panel reminded me again that no matter what you have to say, no matter how well you research it (or are part of the culture), someone, somewhere will tell you that you got it "wrong." Or that you're telling the story the wrong way. The key is to listen to what that person has to say. Consider it seriously and give it respect -- but I think we still have to write what We individually write. This isn't a collective business. My character's truth may not be the exact same as someone else's. As writer's we do our best and never stop growing and listening, but we do so knowing -- honestly -- you can't please everyone all the time. And Marvin Terban made me laugh and brought me joy. What more could I want from a speech? Plus, I got to meet him afterwards and he's a gracious and charming guy. How splendid is that? I can't believe how little I post to this blog. Mostly it's because I do all my blathering on Facebook, but this blog was my first social networking and I am reluctant to let it fall by the wayside. So, once again, I'm trying to turn over a new leaf. 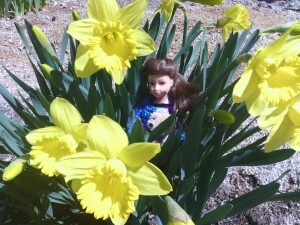 And to underline that -- here's my little give-away doll hiding in the daffys that have been blooming here. I have to admit, I am enjoying spring -- even if it did snow a smidge in CT today (though not near my house). With the re-release of my first book WELLSPRING OF MAGIC and the release of the second book THE EMERALD DRAGON, I'm giving away autographed books, a one-of-a-kind doll dressed as one of the characters, and a handmade wood-burned bookmark. These books are for girls and I've gotten fan mail from girls from 5-to-10, though I think my readership tends to skew youngish for this set. The story focuses on a group of girls who have become fast friends after their families move to a small neighborhood of old homes. An overgrown and slightly creepy park lies at the center of the neighborhood and the girls use one of the park buildings as a clubhouse. Through some mysterious gifts they receive in the mail, the gain access to a magical realm where they have special abilities based on the creative gifts of each girl. The stories are adventures with plenty of action. Without the power of story, you can only travel the roads you can reach. Without the power of story, you can only know the people you can meet. Without the power of story, you can only live a single human lifespan. Story allows us to see anything, meet anyone, do everything without exception. We can be young or old, good or evil, strong or weak. We can be the hero of a thousand tales. I'm always telling myself a story -- always living slightly outside of the place I stand. Sometimes, I stop and I write them down and someone else can live out that story as well. In real life, I'll never be young and in love again -- but story can let me live a thousand loves. In real life, my battles are small and homely -- but in story, I can save a town or a world. Without story, I cannot imagine the weight of a single life lived only moment by moment. Story gives me wings. I'll always be grateful for what story has done for me. And that's why making stories is what I choose to do. Whether I do it well or poorly, my stories offer yet another life for the reader -- another breath to the immortality that is the life of a reader. I'm pretty chuffed about that. It's easy to grow very negative about writing. Revision is time consuming and it's hard to know when you've done enough. Submission is just plain scary -- did you do enough research? Did you avoid doing anything really embarrassing? Then there's rejection -- we crushing part of the writing life. Sometimes I get so caught up in the bad stuff that I actually think fondly of the idea of a full-time job doing something totally uncreative. Then I remember: I have a LOT to be thankful for. First, I create people. Think about it -- the characters you create in your stories didn't exist before they were born in your imagination and delivered by your writing pen (or computer). Your plumber may make more per hour -- but do they invent new people? I didn't think so. I create interesting, lively, special people that I like hanging out with for the duration of the story. Second, I was one of those little kids who was constantly being told to stop being such a dreamer and focus on the real world. Now I'm adult who makes a living by being a dreamer and creating my own world every time I sit down at my computer. I've turned the things that drove my folks crazy into an occupation -- how cool is that? Third, I work with new people all the time. Every time I make a new sale or start a new project, I get to work with more intelligent, creative people in the book publishing business. I've worked with amazing editors. When you're collecting rejection letters, it's easy to imagine the editor at the other end is some cold, cruel entity, but I've had the pleasure of actually getting to know a number of editors. They're lovely people. They love good writing. They truly want to make everything they publish as good as it can possibly be. Now a single one of them gets any joy out of rejection. Fourth, my daughter still thinks I'm cool. She's thirteen, so that's no small thing. She's still waiting for the day when I'm cool AND famous AND rich enough to buy her those boots she wants -- but still...she is proud of me. What could be better than that? Fifth, I get fan mail. Because of the sort of writing I do, I don't drown in it like the famous writers, but I still get it. It's amazing to get a carefully hand-written note from a little girl who loved my book. Sure, sometimes they have some odd ideas about how rich I might be or which celebrities I might know -- but that's okay. Those notes can get a person through a lot of rejection days. Sixth, I work a lot of hours, but they're MY hours. If I need to be at my daughter's school for something -- I go. If she's home sick, I'm here to take care of her. No one looks down on me or questions my "loyalty" to the company because I take care of my family. The bad side of that is that I don't get paid until the work is done -- so there's no paid vacations or paid sick leave for me, but the benefits I do have are pretty awsome. So on this day-after-Thanksgiving -- I have a job to be thankful for. I'm not rich or famous. Most people don't know my name. I don't get invited to talk shows. But I'm a writer and it's the best job in the world -- for me. Thoughout the writing years of my life, I've gotten burnt out by publishing a time or two. The system of submission, hope, rejection, submission again...cha cha cha...can become truly exhausting. It doesn't grow less so just because you're published. It doesn't even become less so when you're making a living from writing. The process of submission and rejection is still demoralizing. And like having someone break up with you by saying, "it's not you, it's me" -- well, it still feels like you. It still feels like failing. And failure is exhausting. It might be educational. It might be an unavoidable part of the process, but it's still exhausting. So sometimes, I get burned out on publishing. Sometimes I even tell myself that I would quit writing if (1) I had another way to make a living and (2) I knew HOW to quit. I daydream about the restfulness of a job that is not filled with rejection. Still, I truly do love writing. BUT. I learned something recently during the forced "vacation" created by being out of power for five days. I was tired. I wasn't tired of the submission/rejection process so much as...I was just tired. I'd been dipping pretty heavily out of the creative well these last couple of years. I have a six-book series coming out in January and a four-book series coming out later in the year. I have a bunch of stray books coming out -- parts of different series not all written by the same author. I've done educational writing and writing about writing. And the only times I took off was when I needed to do something else for the sake of someone else. And I was tired. I was so tired that I actually ran out of ideas to pitch for one publisher. I've never run out of ideas. And I had to give up on a book that just wasn't working. I never give up on something a publisher is actively waiting on. Something was wrong. I was tired. So when the lights were out, I couldn't use the Internet or my computer. And I couldn't really go anywhere. So I stayed home, tucked under a blanket and I read. I read a whole stack of books. I didn't write at all. And it was WONDERFUL. In fact, it was something I fantasized about when I was working so hard. Now that the lights are back on, I feel wonderful. And the amazing thing is that I was dumped off the hampster wheel I run on for a whole week and I'm still not really behind. I'm just refreshed. For the first time in a while. It shouldn't have taken a massive storm and power outage to get me to stop and rest. Sometimes the cure isn't to run faster, write more and dig deeper. Sometimes the answer is to stop writing and do something you've wanted to do but didn't have time. Sometimes the answer is to give yourself a break. I'm going to try to remember that -- I don't know if I will. I'm pretty used to spinning that hamster wheel hard. But hopefully, the next time it won't take a hurricane to get me back in a good splace. But just in case...I hear there's a Nor'easter coming! Anyone in any area of the arts knows it’s difficult to separate yourself from your work. Your writing feels like an extension of who you are. That makes anything said about a piece you’ve written hurt. As long as you’re writing only for your own enjoyment – and not to be published – feeling totally bonded to each thing you produce is fine. But once you begin looking for publication, it can kill you. Not only does rejection hurt, but every single step in the process of publication has fresh hurt for writers who cannot see the piece they produced as something other than a shard of their soul. The first reason you need to separate is because very few people in the publishing process (other than you) are going to equate you with the work you produce. To most people, your story, your article or your book is a product to be examined, considered and possibly bought. For everyone in the process other than you, the situation is about whether they want that product. Imagine if you went to a farmer’s market (something I’m doing a lot these days) and you need some tomatoes. You pass by a booth selling corn. You don’t need corn. You don’t want corn. You have a lot of corn. BUT, the person selling the corn worked hard to grow it. They spent money growing the best corn they could grow. How can you callously walk by without giving the person a long explanation of why you’re not getting corn that day while assuring the farmer that that corn is lovely? You can do it because you go to the market looking for a product and plan to buy the best available example of that product. Imagine if every person whose booth you passed by collapsed in a weeping heap or shouted rude comments at you for passing on the world’s best corn? Right, that farmer would have some problems making ANY money at the market. Acquiring editors and agents are a bit like you shopping at a farmer’s market. They know what they need. They know what they’re capable of using. They might be lured into buying something else (just as I can sometimes be lured aside by a truly lovely golden plum at the farmer’s market) but they also know the things they flatly cannot use. Those things will not be bought. They won’t be bought even if they’re lovely because they aren’t what the buyer needs. They won’t be bought even if the writer worked hard and spent a lot in preparation of the story – because they aren’t what the buyer needs. When you recognize that you’re the seller of the lovely corn, you can understand that not everyone wants corn – no matter how lovely it is. And if you’re a seller of something a bit off-beat like black beets or lima beans, you can understand that the folks looking for those things are going to be even fewer – but if you connect with the buyer looking for exactly what you have…you will make the sale. Don’t give up if the first person – or half dozen people – you offer your corn to are actually shopping for tomatoes. It isn’t about YOU. Editorial response is a second place where writers feel the ouch if they’re overly bonded to their work. In this case, imagine you’re a seamstress who sells one-of-a-kind dresses – offering tailoring for a perfect fit. Now imagine that when it comes time to actually make the changes to fit the customer, you balk. You’ve already lined up a customer. Why can’t she adjust to the dress? Doesn’t she know that shortening the sleeve will mean removing some lace!! Doesn’t she know that if you take in the bodice, it will look different from the way you created it and wanted it!! Doesn’t she know shortening the hem will throw off the proportions you intended!! How quickly would you want to buy from a seamstress who expects you to change to fit the dress instead of the other way around? For the most part, editors know what they need from a writer. And marketing is sometimes helpful to put in remarks about what they need to get tons of sales out of the book. These suggestions OFTEN don’t fit what you thought about the story, article, or book – at least at first. Tailoring your story in response to editorial input requires an act of trust, and that’s really had to do if you see that piece as a slice of you’re soul. What do they mean by saying my SOUL needs changing!! They aren’t saying that. They aren’t buying YOU. They’re looking for a product that meets their needs, the needs of the reader, and/or the needs of the market. It isn’t about YOU. Mostly neither are amateur book reviews. Readers read a book in light of what they like. For them, it’s a bit like sipping soup. If they are sensitive to salt – the taster may complain that the soup is salty, even if it tasted perfect to the chef. Do you know what that means? It means the soup was too salty for that person – that’s it. That’s all it means. It doesn’t mean the person has no taste. It doesn’t mean the person hates the chef. It means the person didn’t like the level of salt. Book reviewers can be the same way about a book. A reviewer can complain that a story you loved and labored over was too predictable, too racy, too mature, too immature, too preachy, or that it doesn’t do enough to uplift the youth of America. And for each review, the words that wrote reflect the reading experience of that person. It doesn’t just happen to new writers, best selling writers, religious writers, secular writers, good writers, bad writers – ALL writers get reviews that say things the writer would not agree with. That’s because the reviewer is a reader with his/her own set of tastes and values. It’s all about the reviewer and his/her experience with the story/article/book. It’s not about YOU. AND guess what. If a reviewer didn’t like your book (or your favorite book) that doesn’t mean the reviewer is JEALOUS. It means the reviewer’s experience with the book was different from yours. Difference doesn’t mean invalid or jealous. Sure, if that gets you through the day…go ahead and think it in the quiet of your own head. But don’t post it online. It makes you look bad. Honestly; it does. So when you get your rejections (and we all get them) or discover your masterpiece needs some rewriting (and we’ve all faced it) or find out not everyone loved the thing you wrote – even though you did – keep in mind. None of that is about you. You are not your book. You’re a person who is infinitely more complex and wonderful than the work you produce. Sure, it’s stings to get negative feedback on your art – but you can shake it off, you can keep moving forward, and you can at least put forth a public face that is professional and flexible. Don’t cry over your corn. It’s not about you. Humans have always loved stories. Some of the earliest people used walls in caves, walls of buildings, and even rocks to tell their stories. When the bulk of the population in Europe couldn’t write, they gathered around oral storytellers with rapt attention. Stories offer us a window into an experience that is not our own. And if the storyteller does his job well, the story ends up belonging to the listener as well as the teller. A good story, well told grows in the mind of the listerner. Oral storytelling is an amazing art. You have the power of the words but also the instrument of the human voice. And you can move as you speak, expanding the story with gesture and expression. Oral storytelling captivates the people listening as the speaker performs. Written storytelling captivates the reader who is not there are the writer performs. Oral storytelling is for the “now” and written storytelling is for the future. The writer creates for the future reader. The story’s biggest fan might not even be born yet as the writer sits alone (or perhaps surrounded by distractions) and creates. Storytelling is a creative act. If you accept that people truly are made in the imagine of God; it is in this act of creation that we most look like our creator. Writers create people, places, voices, action that did not exist until that writer sat down and began putting those word on paper. Similar worlds may have existed (sometimes too similar) but nowhere can you find EXACTLY that selection of words, images, and personality. As a writer, I can imagine a character who could not exist in the real world. I can imagine a sweet natured and terribly innocent bear who lives in a cottage in the woods. I can imagine that he wakes to find an uninvited and unexpected houseguest in bright yellow curls eating everything in his kitchen. I can imagine the bear’s vexation, but bound by the rules of hospitality, my bear might find himself trying harder and harder to meet the demands of this bossy golden haired guest. Then I might imagine the bear discovers that the bossy guest is actually his nemesis fox in a yellow wig, tricking bear out of a big breakfast. I can imagine that bear wins in the end. As I imagine all this, I borrow from trickster tales all over the world. I borrow from a European fairy tale. I borrow from the picture book tradition of kind, cuddly bears. I even pinch a bit from old absurd cartoons where a bad wig or a crooked mustache renders a character totally unrecognizable to his friends. But I create something different from all those things. And in the creation, I speak about my own feelings on hospitality and house guests. At the time I am writing, I have no audience. At the point of creation, I don’t do the careful editing in response to audience cues that oral storytellers do. I have only my own pleasure (and my experience as a writer) as my guide because at that first writing – I’m only telling myself a story. It is as if I am storytelling at the end of a tunnel and the reader is at the other end. I’m writing with the hope and belief that eventually the story will make it through that tunnel of revision and submission to reach the reader. Why do I do that? Mostly I do it because of my own enjoyment and need for stories. I need the stories I read. The stories I hear. Even the stories I watch on television. And because others have met that need for me, I step up with trepidation and try to produce something that will help feed that need for others. I take joy in the writing. First and foremost I’m telling myself a story. But then, I push it into the tunnel and hope it reaches the other end where I’m telling the story to others.